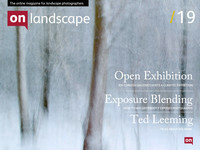 A few months ago, Joe Cornish galleries made an open call out for entries into a competition to exhibit at the gallery. Entrants were asked to speculatively submit framed images and the winners would be hung at the gallery. We went down to the gallery and asked Joe to show us around. We did have a problem with noise toward the end of the video (our video camera does not allow external microphones - we'll use a second recording device next time) so our apologies if it's a little difficult to hear.